Justin the Canuck hosted the show, our last during KOOP’s spring membership drive. 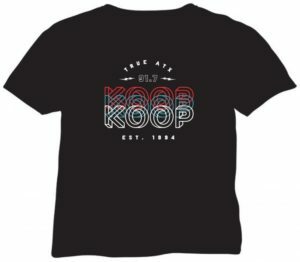 Help keep the Canadian in KOOP! Today marks our second and final show of KOOP’s Spring Membership Drive, which means it’s your last chance to show your support for independent Canadian music on the Austin airwaves by renewing your KOOP membership—or by becoming a new member! This Great White North and the myriad other unique, homegrown programs on Austin’s premier community radio station are more than 90% supported by listeners just like you! And so, twice a year, we ask for your support to help keep us on the air and spinning the tunes you love from north of the border. We’d love your call during our show today—4:30 to 6:00 PM Central Time—where our friendly phone answerers (including Doug the Canuck and Chris of The Last Roundup) will be delighted to accept your pledge of support for KOOP. Simply call 512 472-5667! You may also donate securely online at KOOP.org. Please support the most authentically Austin programming in town—from This Great White North, to our dozens of other only-in-Austin music programs, to our informative and unique news and public affairs shows. We’re counting on you to keep this community strong! Doug the Canuck hosted the show, our first of KOOP’s spring membership drive.